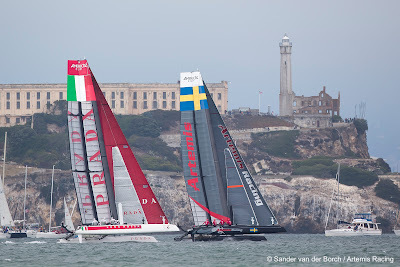 At 1405 the start gun went off for the Match Racing Quarters Finals with Skipper Terry Hutchinson (USA) lining up against Paul Campbell-James on Luna Rossa – Swordfish. Hutchinson controlled the pre-start and the Italian team was hot on the Swedish team’s heals throughout the race. Artemis Racing – White’s crew work was seamless and tactical calls were spot on. This win moved Artemis Racing - White into the Semi-Finals on Saturday. Two fleet races swiftly followed for the fans lining the shore along Marina Green. 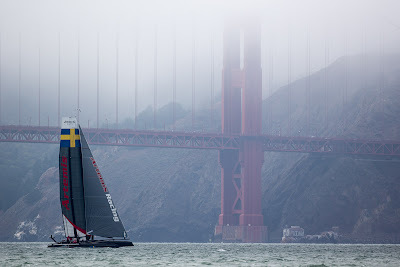 Good starts for both Artemis Racing AC45s in the second fleet race, saw Santiago Lange’s Artemis Racing – Red place second while Hutchinson’s Artemis Racing – white was third. At the end of the day, the Artemis crews are tied on points in the fleet racing, which continues tomorrow afternoon.